I absolutely love classically chic kitchen decor ideas like something that could be found in a 1950s downtown penthouse apartment. 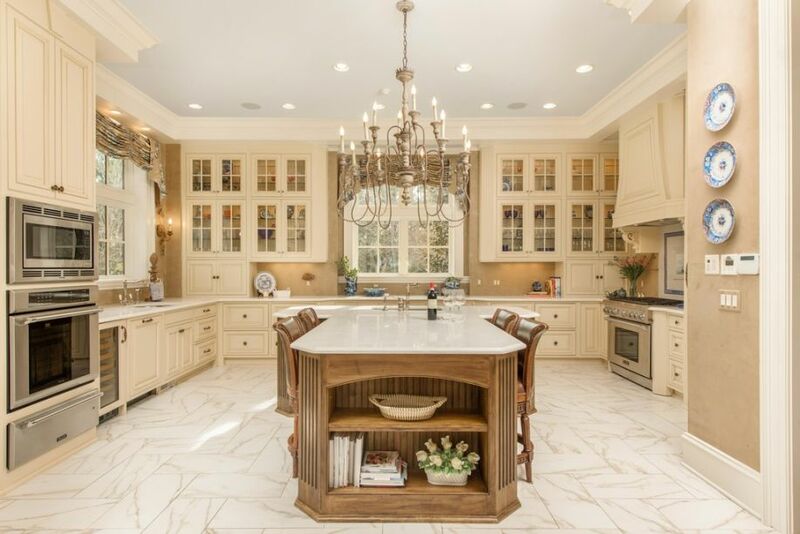 These traditional designs found in beautiful kitchens like this always inspire me to live my life with elegance and style even when I am slaving away at the stove. My favorite part of this particular design is the gorgeous antique chandelier hung over the island table. It is the perfect piece to tie together the entire design and, again, brings such a timeless elegance to the room. My second favorite part of this particular home is the quaint kitchen wall decor like the china plates hanging on the wall and the lovely custom window treatments accenting the large farmhouse sink. When these homeowners told me that they wanted to use kitchen decor ideas that would make their home feel like a modern log cabin, I was certainly up for the challenge! I thrive on creating fun kitchen decor themes that some may consider "out-there" or unexpected, but that I prefer to call whimsical and unique. 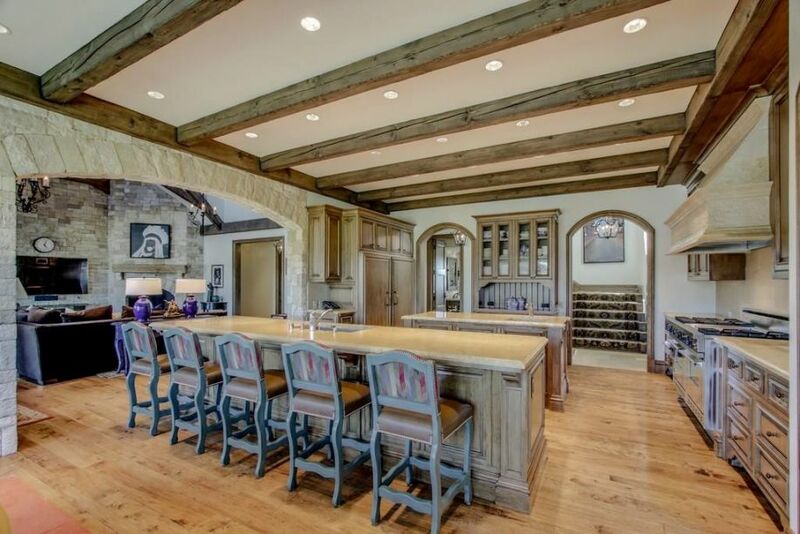 The first project we took on was installing these gorgeous wood beams across the entire kitchen ceiling. This set the foundation for a rustic design, but still had a slightly modern edge with the natural stain we left on them. To tie into the wood beam ceiling, we opted for a kitchen cabinet design that also featured natural wood but in a slightly more refined way. A lot of people are nervous to use ultra modern kitchen decor ideas in their home because they worry that it will alienate potential buyers that prefer a more traditional style. While I certainly understand that concern, I think that if you enjoy modern kitchen design, you just just go for it and really commit to the style like these homeowners did. Sure you may alienate a certain sector, but you will also wow those who really enjoy that particular look. 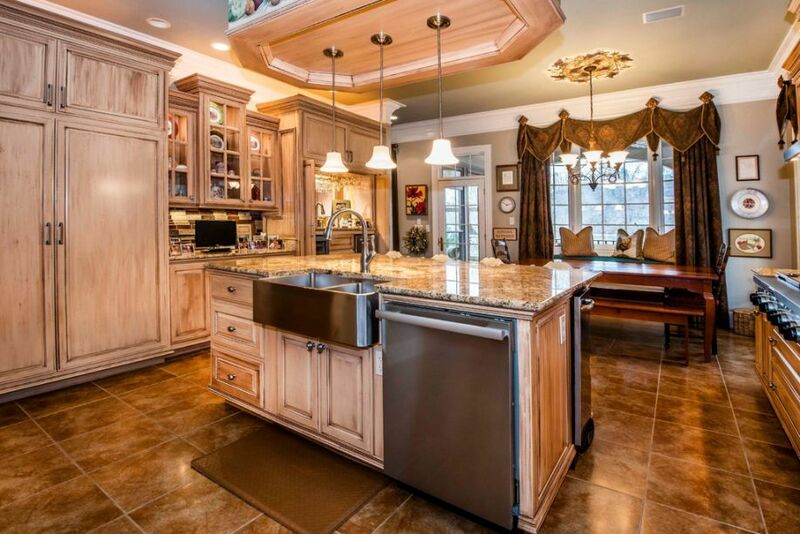 For example, I was really drawn to this home primarily because of the awesome contemporary kitchen. 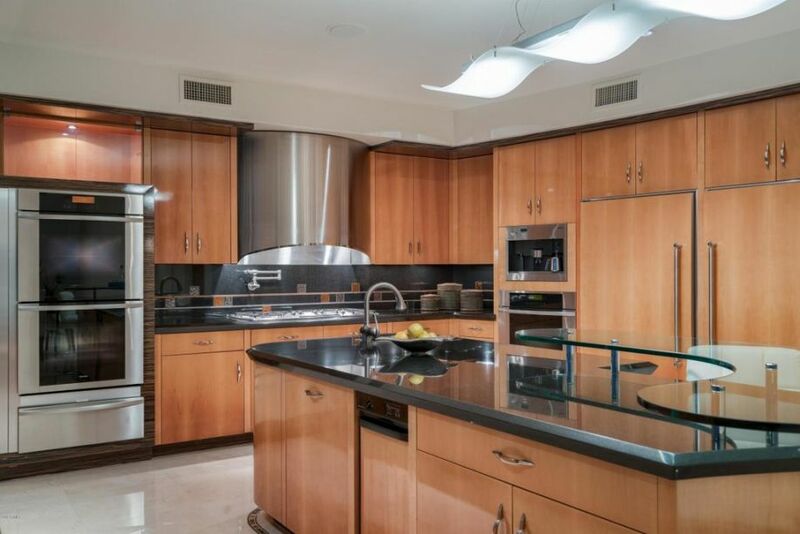 Between the cool domed stainless steel hood, sleek wood kitchen cabinets, and black granite countertops, the entire space has a very futuristic look that really works. When my client asked me to use rustic and unexpected kitchen decor ideas in their already quite modern home, I was certainly up for the design challenge. I am most known for my unique kitchen styles that mix and match both trendy looks and classic elements in order to create an absolutely timeless design. 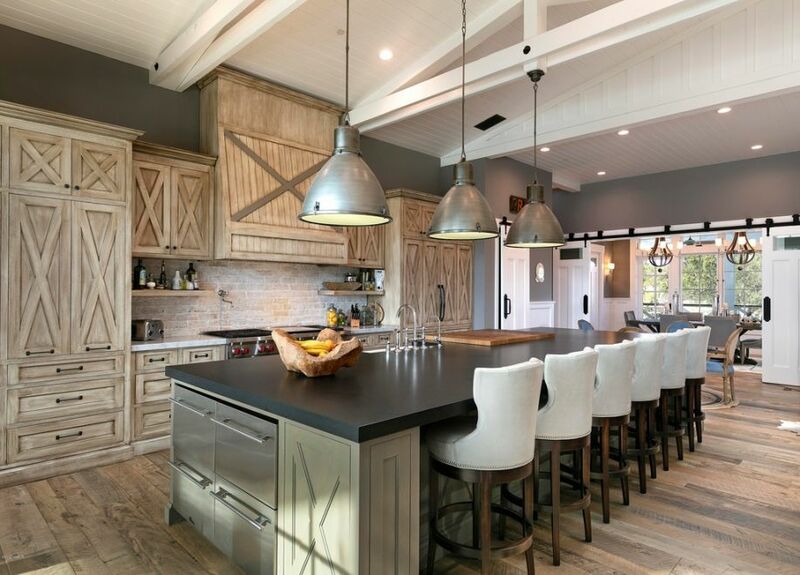 We certainly achieved this fantastic dichotomy in this space between the barn wood cabinetry and custom hood paired alongside a sleek black granite island and industrial style pendant lights. I wanted to add rustic kitchen decor in a way that did not make the space look cliche, so we kept all of those aspects teetering on the line of modern and country. When I moved into my grandmothers house that I spent most of my childhood playing at, I knew that there were certain areas that I wanted to keep as they had always been. 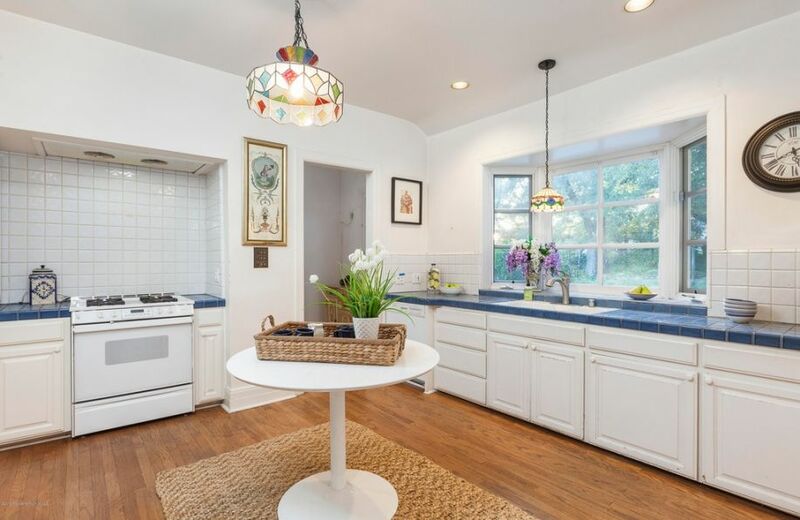 For example, I wanted to preserve some of her vintage kitchen decor ideas that I remember most from when I was little like her Tiffany lamp hanging in the center of the room, her bright blue counter tops, and the bright bay window that we used to store plants in. In order to make these elements really pop, I decided to surround those fun elements with simple white kitchen designs that would remain classic over the years and provide a nice neutral backdrop to the more playful pieces. I had never thought to use very formal pieces alongside your more functional kitchen decor ideas like these homeowners did but, I must say, I really love the combo. Something about combining luxurious damask drapes alongside more rustic style cabinetry is a really cool combination and one that makes the kitchen stand out from all that I have seen before. Most people would never think to use country kitchen decor in such a way, or to combine it with more lavish furnishing but I think that it really elevates the overall style and makes both themes a bit more mainstream. This really encourages me to play around with kitchen themes and to combine them in unique and unexpected ways in order to create a design all my own.